Acne is a skin condition that causes pimples or "zits." Whiteheads, blackheads, and red, inflamed patches of skin (such as cysts) may develop. Acne occurs when tiny holes on the surface of the skin become clogged. These holes are called pores. Each pore opens to a follicle. A follicle contains a hair and an oil gland. The oil released by the gland helps remove old skin cells and keeps your skin soft. The glands can become blocked with a mixture or oil and skin cells, the blockage is called a plug or comedone. If the top of the plug is white, it is called a whitehead. It is called a blackhead if the top of the plug is dark. If bacteria become trapped in the plug, the body's immune system may react to it, causing pimples. Acne that is deep in your skin can cause hard, painful cysts. This is called nodulocystic acne. Acne is most common in teenagers, but anyone can get acne, even babies. The problem tends to run in families. Hormonal changes that make the skin oilier. These may be related to puberty, menstrual periods, pregnancy, birth control pills, or stress. Greasy or oily cosmetic and hair products. Certain drugs (such as steroids, testosterone, estrogen, and phenytoin). Birth control devices such as some drug containing IUDs that can make acne worse. Research does not show that chocolate, nuts, and greasy foods cause acne. However, diets high in refined sugars or dairy products may be related to acne in some people, but this connection is controversial. Your health care provider can diagnose acne by looking at your skin. Testing is not needed in most cases. Bacterial culture may be performed with certain patterns of acne or to rule out infection if large pus bumps persist. Clean your skin gently with a mild, nondrying soap (such as Dove, Neutrogena, Cetaphil, CeraVe, or Basics). Remove all dirt or make-up. Wash once or twice a day, including after exercising. Avoid scrubbing or repeated skin washing. Shampoo your hair daily, especially if it is oily. Comb or pull your hair back to keep the hair out of your face. Try not to aggressively squeeze, scratch, pick, or rub the pimples. This can lead to skin infections, slower healing, and scarring. Avoid wearing tight headbands, baseball caps, and other hats. Avoid greasy cosmetics or creams. DO NOT leave make-up on overnight. If these steps do not clear up the blemishes, try over-the-counter acne medicines that you apply to your skin. Follow the directions carefully and apply these products sparingly. These products may contain benzoyl peroxide, sulfur, resorcinol, adapalene, or salicylic acid. They work by killing bacteria, drying up skin oils, or causing the top layer of your skin to peel. They may cause redness, drying, or excessive peeling of the skin. Be aware that benzoyl peroxide containing preparations can bleach or discolor towels and clothing. A small amount of sun exposure may improve acne slightly, but tanning mostly hides the acne. Too much exposure to sunlight or ultraviolet rays is not recommended because it increases the risk for skin cancer. If pimples are still a problem, a provider can prescribe stronger medicines and discuss other options with you. A pill called spironolactone may help. Birth control pills may help in some cases, though they may make acne worse in some women. Photodynamic therapy may be used. This is a treatment where a chemical that is activated by blue light is applied to the skin, followed by exposure to the light. Your provider may also suggest chemical skin peeling; removal of scars by dermabrasion; or removal, drainage, or injection of cysts with cortisone. Pregnant women should NOT take Accutane, because it causes severe birth defects. Women taking Accutane must use 2 forms of birth control before starting the drug and enroll in the iPledge program. Men also need to be enrolled in the iPledge program. Your provider will follow you on this drug and you will have regular blood tests. 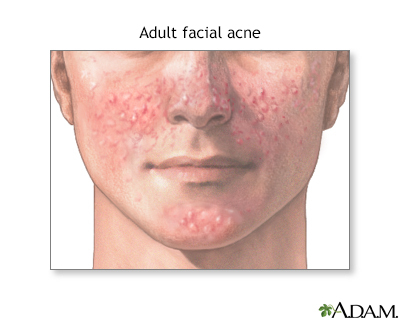 Most of the time, acne goes away after the teenage years, but it may last into middle age. The condition often responds well to treatment after 6 to 8 weeks, but may flare up from time to time. 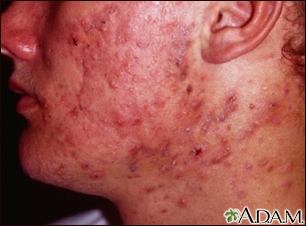 Scarring may occur if severe acne is not treated. Some people become very depressed if acne is not treated. Self-care steps and over-the-counter medicine do not help after several months. Acne is causing emotional stress. If your baby has acne, call the baby's provider if acne does not clear up on its own within 3 months. Habif TP. Acne, roacea, and related distorders. In: Habif TP, ed. Clinical Dermatology. 6th ed. St Louis, MO: Elsevier Saunders; 2016:chap 7. Walsh TR, Efthimiou J, Dreno B. Systematic review of antibiotic resistance in acne: an increasing topical and oral threat. Lancet Infect Dis. 2016;16(3):e23-33. PMID: 26852728 www.ncbi.nlm.nih.gov/pubmed/26852728. 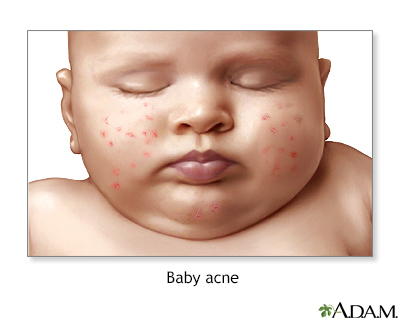 Baby acne is usually seen on the cheeks, chin, and forehead. It can be present at birth but usually develops around 3 to 4 weeks of age. Baby acne occurs when hormonal changes in the body stimulate oil glands in the babys skin. The condition can look worse when the baby is crying or fussy, or any other instance that increases blood flow to the skin. Baby acne is harmless and usually resolves on its own within several weeks. 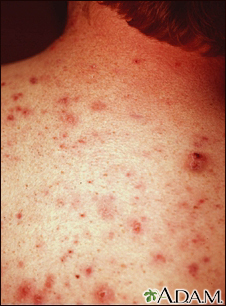 Acne lesions frequently contain pus. 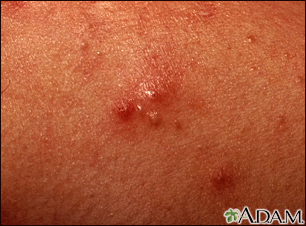 This close-up photograph shows small acne pustules with surrounding inflammation (erythema). 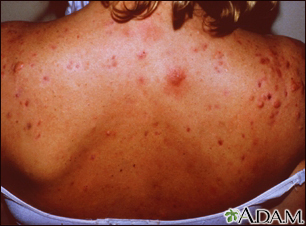 Cystic acne may occur across the upper chest as well as on the back. Acne frequently occurs on the back. Here, there are 2 to 6 millimeter wide erythematous (red) pustules with large open and closed comedones. Permanent scarring may follow a severe case of acne. Men are more often affected on their shoulders and back than are women. Acne affects the areas of the skin that contain sebaceous glands, including the face, upper chest, and back. 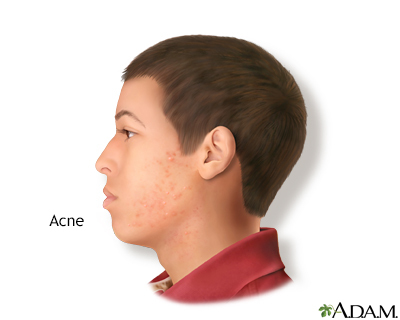 Acne occurs most commonly during adolescence. Many new treatment regimens are available for acne, especially for the most severe types. Acne is a skin condition that causes whiteheads, blackheads, and inflamed red lesions to form. These growths are commonly called pimples or "zits." Three out of four teenagers have acne to some extent.